The ecoBright® RSK™ Reflector range is an innovative and effective range of specular parabolic reflectors mounted on linear fluorescent lamps, to enhance light performance and energy saving with narrow or wide light beam and adjustable direction. The ecoBright® RSK™ Reflector range is made in Europe under an ISO9001 Quality accredited manufacturing process from advanced materials and to exacting performance standards. ecoBright® RSK™ Reflectors deliver premium performance and will enhance the output of any linear fluorescent lighting system to ensure light is delivered where it's needed. The ecoBright® RSK™ Reflector range is application specific and helps to ensure the right product is specified depending on the height of the lamp and luminaire for each and desired result. i. Enhances Lighting System aesthetics - a unique aesthetic outcome is achieved as even simple luminaires are converted into an interesting visual fitting of high performance. Installing the ecoBright® RSK™ reflector is a simple matter of removing the fluorescent lamp from the luminaire, sliding the lamp into the reflector and then replacing the lamp/reflector assembly back into the luminaire. 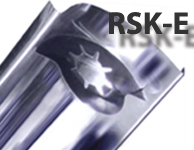 The ecoBright® RSK™ reflector range comes with a standard global 3 year warranty. The ecoBright® RSK™ reflector range is manufactured in a state of the art facility located in Europe, under a manufacturing process accredited to International Quality Standard ISO 9001.
ecoBright® energy solutions are exclusive suppliers of the ecoBright® RSK™ reflector in Australia and sole distributors in New Zealand and the Pacific Islands.